Millcreek Herbs LLC - Herb Articles - Healthcare: Wildcrafting - Dedicated to the understanding, wise use and enjoyment of herbs. Merry's articles and herbs research will help you to learn more about medicinal herbs, culinary herbs and the wellness benefits of Complimentary Alternative Medicine (CAM). What does the term "wildcraft" mean? I see it on some labels for herbs in the health food store. Wildcrafting refers to the activity of harvesting herbs or mushrooms from places where they are not cultivated. This could be on mountaintops, alongside country roads, or even at abandoned homesteads. Wildcrafting is a great activity for the entire family because the search for the plants usually takes you to beautiful places so you can pack a picnic or even camp along the way. And this is the season when wildcrafting is at its best. Have an idea of what plants you want before you go. Get into your herb books and learn the most likely places to find them. Because each species of plant grows at certain elevations and under particular conditions, you need to get to those places at the best time for harvest. Make sure you have the necessary supplies to do the job - gardening snips, jars or paper bags. The term "ethical wildcrafting" means that one becomes a steward of the land and its plants, only taking what is needed in a way that will not interrupt or greatly reduce the number of plants of a certain kind. Stinging nettle grows in large patches near many canyon creeks. Fresh leaves can be cooked and eaten as a green; cooking removes the sting. Once dried, the plant no longer stings. Strip the leaves from the dried stems and add to food or make a tea for extra minerals and nourishment in your diet. Pick nettle where the soil is clean. Nettle is so good at extracting minerals from the soil that it gets planted around extremely polluted locations like Chernobyl to rid the soil of toxins. Caution: Wear long sleeves, pants and gloves when harvesting; the tiny hairs on the stems cause pain and welts if they touch the skin. The plant chemical that causes the sting is water-soluble. If you rinse it away quickly, the sting stops. Dandelion leaf is best picked at higher elevations in cool, moist areas where the leaves grow very large. Dandelion is super nutritious and a nonpotassium-leeching diuretic. I like to chop up a bunch of fresh leaves, pack them in a jar and cover them with vinegar. In two weeks, I strain out the plant and store the vinegar in the fridge to add to salad dressings or to use for a quick liver cleanse with water first thing in the morning. Alfalfa, juniper berries, rosehips, willow bark, elder flowers, cleavers, valerian and arnica also grow abundantly in this area. Don't pick anything in areas that are under a lot of pressure like our well traveled recreation trails near the Salt Lake Valley, and steer sensitive areas such as clear of springs. Surrounding states, Montana, for example, established very clear laws prohibiting the taking of plants from public lands after a small species of echinacea was obliterated from its natural habitat. To my knowledge Utah's laws are not that strict, but it would only take one ruthless (or clueless) person to overharvest some plants from fragile environments for the same to happen here. When deciding where to harvest plants, make sure the soil and water are clean. Look around to be sure that the area is free of animal waste (look out for signs of grazing cattle on Forest Service and BLM lands) and sources of pollution such as runoff from a busy paved road. Most importantly, know your plant! Be sure that what you are harvesting is what you think it is. When in doubt, don't. When you shop for herbs, read the label to understand where the herb came from and how it was harvested. 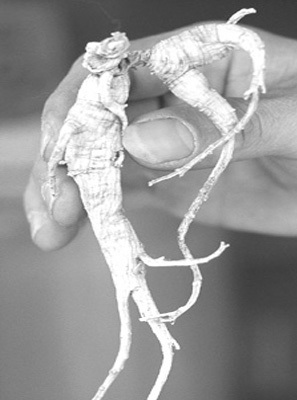 Herbs such as goldenseal and American ginseng have been harvested practically to the point of extinction. Don't buy these two herbs if the label says "wildcrafted;" look for "woodsgrown." This term means that someone tends it well in its natural habitat, making sure the plant can continue to propagate itself.